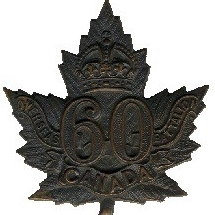 March 1916 – The 60th Battalion C.E.F. "Victoria Rifles of Canada"
Battalion’s first battlefield death – Pte. John Rae Morgan #457306 who died from wounds at No. 2 Casualty Clearing Station. 2nd Division involved in attacks at crates at St. Eloi – officially known as the Actions at St Eloi.